EMH7600 is designed with high efficiency step up DC/DC converter for portable devices applications. It features with extreme low 26μA quiescent current with no load which is the best fit for extending battery life during the standby mode. The start-up voltage is 0.83V typically with operating voltage down to 0.6V. 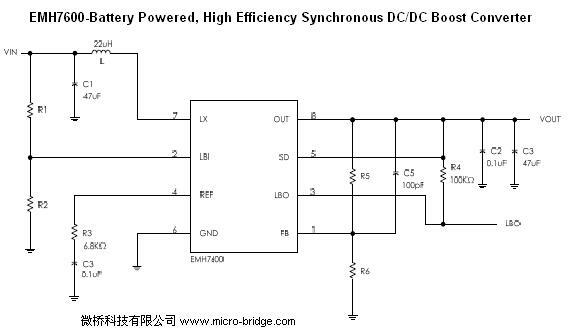 With Synchronous structure, it does not need any external Schottky diode. The peak current is limited to 1A for quick turn on. The EMH7600 is available in MSOP-8 package.